Modern mammals, including humans, could be at risk of shrinking as a result of global warming, just as teeny prehistoric horses shrank to an even smaller size when temperatures rose 56 million years ago. Early horses were already quite tiny to begin with in comparison to modern beasts, which have been helped along by people breeding them for size, speed and strength. However, during the Paleocene-Eocene Thermal Maximum (PETM), when temperatures on the planet rose by around 10 to 20 degrees Fahrenheit (about 5.5 to 11 degrees Centigrade) over 175,000 years, they dwindled to about the size of a cat, according to a study published in journal Science. 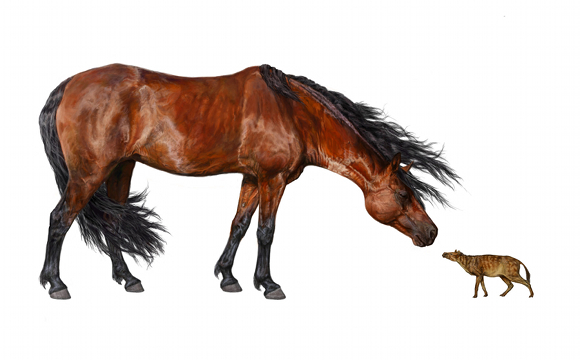 “Horses started out small, about the size of a small dog like a miniature schnauzer,” said author Jonathan Bloch from the Florida Museum of Natural History. Sifrhippus, the earliest-known horse, turns up in the fossil record in North America during the PETM, when concentrations of carbon dioxide in the atmosphere and oceans caused temperatures to get hotter across the planet. The bone-bothering boffins analysing the fossils of Sifrhippus discovered that the animal had gone from about 5.5kg to roughly the size of a cat, around 4kg, as the world hotted up. Towards the end of the PETM, when the planet had started to cool again, the teeny horse started to grow again, reaching around 7kg. It's not the first time that scientists have noticed that mammals seem to be smaller in hotter climates, and have speculated that evolution takes care of this, because smaller animals will thrive in high temperatures because their bodies are easier to cool. But the direct link between temperature and size that this study gives raises questions about how plants, animals, and even people, might react to rapid climate change. Philip Gingerich, the researcher who first looked into shrinking animals during the PETM, said modern mammals could dwindle as a result of the current warming patterns. And in fact, a shrinking world population might not be a bad thing. Other scientists have suggested that getting a lot smaller might help with other global problems, like the fact that we're running out of food and using up too much fossil fuels to drag our obese selves around, thereby releasing too much carbon dioxide. However, the potentially rapid nature of climate change now could mean that evolution doesn't have time to work its magic, so the handy planet-saving, human-rescuing shrinking doesn't get a chance to get going.